Council’s Displan is a local Counter-Disaster plan developed for the protection of the communities within Narrabri Shire. 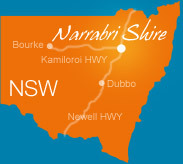 This plan includes incident response, preparedness measures, the conduct of response operations and the immediate recovery measures for local emergencies within Narrabri Shire. The Operations Coordination Plan has been put together by the Narrabri and Moree Bushfire Management Committees to coordinate operations in regards to Bushfire readiness, detection and response.